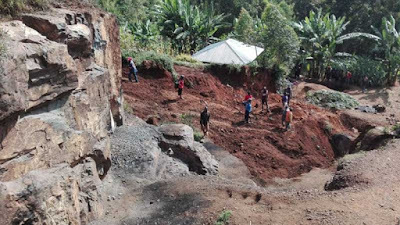 A private quarry collapsed Monday morning in Getare village in Bonchari, Kisii County Kenya, killing two workers. The two; Dauglous Ratemo and Daniel Okero in their mid-thirties died after a huge stone fell on them few minutes after reporting to the site. According to Evans Onsarigo, a brother to the deceased; the two were great friends and had been working together. "They have been working as casual workers at the site. It is painful that we have lost young souls. This is a delicate exercise that the Government has to intervene and have it regulated," said Onsarigo. Richard Ratemo who witnessed the accident raised concerns over the manner of mining in the area. "Those willing to continue with mining in this area should first check on their safety. Those who have employed our youths should think of improving the working environment," he said.